Tune Sweeper cleans your iTunes library by scanning for and removing any duplicate tracks which may be present. Removing duplicate tracks from iTunes keeps your music collection tidy and also saves disk space. Missing Artwork - Tune Sweeper can attempt to download any artwork for tracks in your iTunes library that currently have none. Missing Tracks - Tune Sweeper can scan your iTunes library and remove any tracks that have been moved or are no longer on your hard drive. If left in your library these tracks will not play but instead will display a small exclamation mark. Not in iTunes - Tune Sweeper can detect tracks which are on your hard drive but not currently in your iTunes library. Tune Sweeper can then add the detected tracks into your iTunes library with just a single click. Fix Track Info - Tune Sweeper can use digital fingerprinting to obtain any missing track information. Make unknown tracks, albums and artists a thing of the past! Apple Music - Identify tracks in your iTunes library which would be lost if you were to cancel an Apple Music subscription. iTunes Statistics - Tune Sweeper can analyze your iTunes Library and produce graphs detailing your preferred musical tastes. 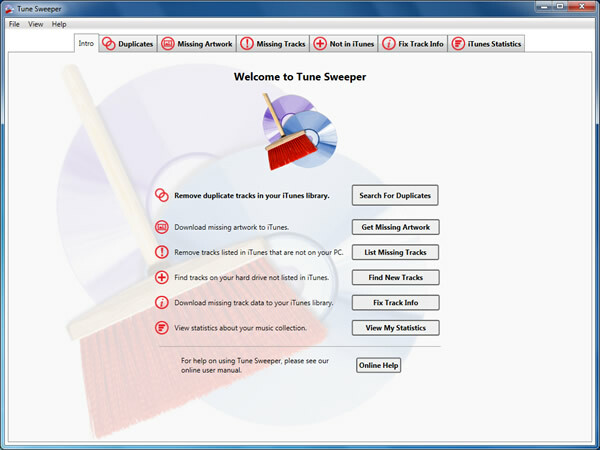 To get started with Tune Sweeper now, go to the quick start page. If you require further information or guidance on a specific feature, please go to the page associated with that feature. Tune Sweeper runs under Microsoft Windows Vista, Windows 7, Windows 8/8.1 or Windows 10. Tune Sweeper requires iTunes 10, 11 or 12 to be installed on your computer. Tune Sweeper 4 requires an Intel based Mac running OS 10.8 or higher. Please visit the Tune Sweeper web page for the most up-to-date system requirements to be able to run the latest version of Tune Sweeper. See the Tune Sweeper Terms and Conditions for more information.